All, this is my first blog and I am not sure if this is a good format or not. I am attempting to present the MSCRM 4.0 Mail Merge feature in a manner I hope to get you started right away. Mail Merge in CRM was first implemented in version 3.0 and supported accounts, contacts and quotes. V3 templates existed but were difficult to work with. V3 did not support mail merge from the web client. 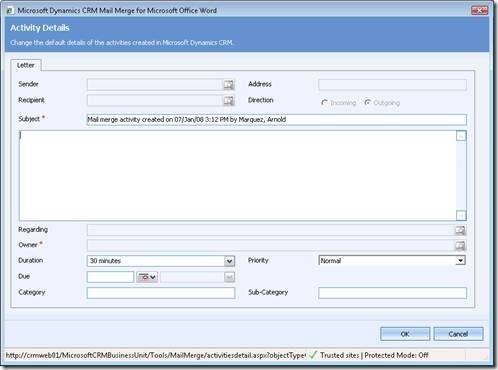 While MSCRM 4.0 Mail Merge is able to run on both the Outlook and the web clients, the Outlook client provides more functionality than the web client. Functionality the Outlook client provides over the web client is the ability to create activities associated with the mail merge (to help keep track of who received the merges), automatic upload or update of new or existing templates, the ability to create Quick Campaigns from the Mail Merge and the ability run Mail Merges from Quick Campaigns. These Quick Campaigns are containers for the activities created by the mail merge. Another advantage the Outlook Client Mail Merge has over the Web Client Mail Merge is the use of a Visual Basic Macro to enable Mail Merge. Outlook Client Mail merge does not need the macro. MS Word, by default Macros are disabled and require enabling or trusting the MSCRM Mail Merge Macro. Since the Outlook Client Mail Merge has the most functionality and is most interesting, this will be the focus of this blog. To start the user must have a Security Role that has the required Outlook privileges to operate the Outlook client and the ‘Mail Merge’ privilege set to a level appropriate with the level of access for the user. To use the web client on a mail merge the ‘Web Mail Merge’ privilege must also be set to the level of access for the user. While on the subject of privileges, the user should also have access to the entity for the mail merge (Accounts, Contacts, Leads, Opportunities, Quotes and Custom Entities) and any related entities that we might want to merge data from. Luckily, the MSCRM Team has some built-in Security Roles, like Marketing Manager, Sales Person, Receptionist, Customer Service Representative and Customer Service Manager, already have the settings for Mail Merge and Mail Merge Template creation. Mail Merge Templates also require specific privileges; the Create, Read, Write, Delete, Assign and Share privileges set to a level appropriate with the level of access for the user. 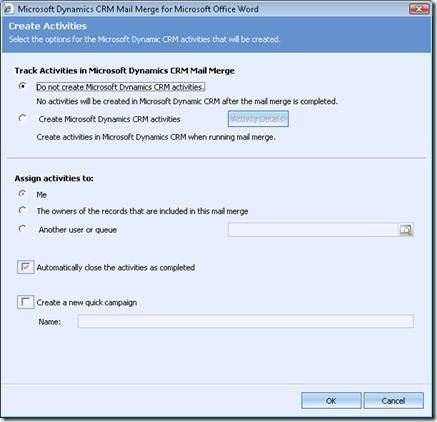 With the exception of the first step, the steps below are intended to give the basic steps to perform an MSCRM Mail Merge from the Outlook Client, regardless of the point of invocation. 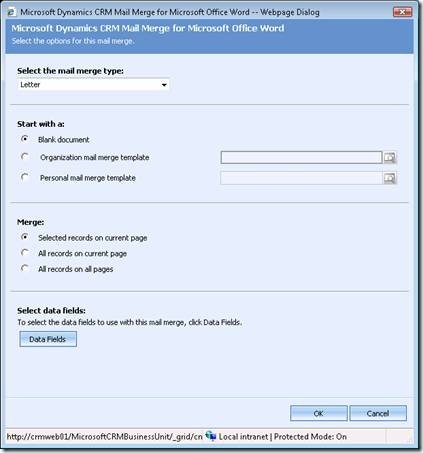 For individual records, MSCRM Mail Merge can be invoked from the ‘Actions‘menu on an entity form. Sets of records returned by Advanced Find or included in a Mailing list are also points of MSCRM Mail Merge invocation. Start the MSCRM Outlook client and navigate to the MSCRM Contacts page (we need a couple of contacts to start with). From the MSCRM Contacts page, select the contacts to include in the merge and click on the Mail Merge Icon (looks like a Word Symbol on a Page). This opens the Mail Merge form. From the Mail Merge form, select a mail merge type of Letter. Letters, E-mails, Envelopes and Labels are supported and this mail merge type corresponds to MSWord’s mail merge types, which will set for you when you enter the mail merge. Select the radio button option for the ‘Organization mail merge template’ which will allow you to select the template to use. Click on the Look-Up Icon and from the Look-Up Records dialog and select a mail merge template to use for this merge. Templates are either Organization (available to other users) or Personal. When saving a template from a mail merge the default is set to personal. This can be changed in the Mail Merge Template form or from the Mail Merge Template grid (Settings | Templates | Mail Merge Templates). At this point we can click the OK button to start the merge (opens MSWord). 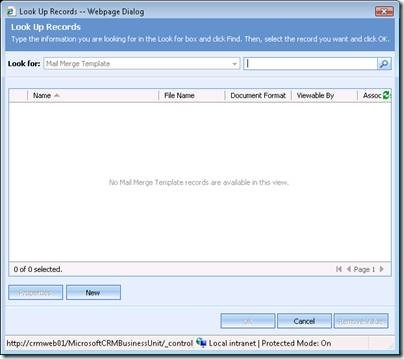 – The Merge section changes what records can be used for the merge. 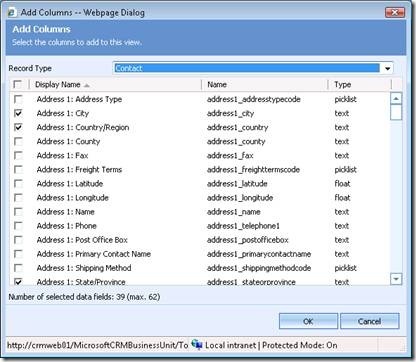 – The Data Fields button opens the Add Columns dialog, where additional entity and related entity fields can be selected to be included in the mail merge. Note: There is a 62 field limit and some juggling may be required to uncheck fields you will not use and check fields you require. The first time a Mail Merge Template is opened a Macro Alert will be displayed. 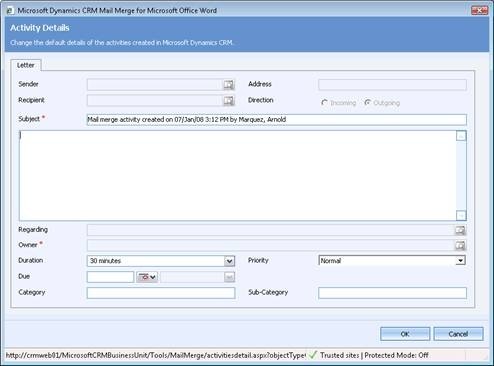 Set Word to allow macros to run and click on the CRM Mail Merge Icon to run the Macro. After the Macro runs, Word’s ‘Select Recipients’ dialog will appear. Click the OK button to continue with Mail Merge from the Wizard located in the task pane. Click ‘Next: Preview your letters’ to view the merge before printing. The ‘Preview your letters’ section has buttons that can be used to view each of the letters we are merging. – With the exception of Envelopes and Labels, the ‘Write your letter’ will be visible. At this point you can add text and/or additional fields to the mail merge document from the ‘More Items…’ hyperlink or from Word’s Mailing menu. – Mail Merge Field tags can be identified by the beginning ‘<<’ and ending ‘>>’ characters. To see field details use the Ctrl + F9 to toggle the field markers. 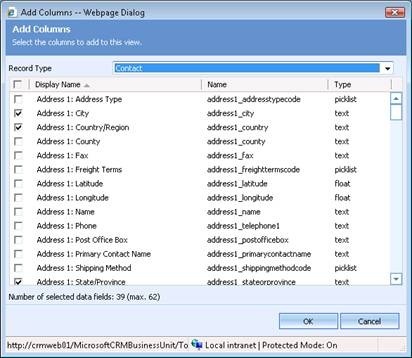 Click ‘Next: Complete the merge’ to navigate to the ‘Complete the Merge’ task pane. In the Merge section, click the ‘Print’ item to open the ‘Merge to printer’ dialog. – Optionally, from the Outlook Client only, the ‘Upload Template to CRM’ item should be visible. From this option, you can update the template you started with (assuming correct privileges) by clicking the ‘Yes’ button or create a new one by clicking the ‘No’ button. Cancel will stop the operation all together. – You can create a template for later use then continue with the merge. If you are creating a new document from scratch, use the Blank Document option and just write the letter, preview it with entity data and upload the template. You can then just quit word and not save changes as the changes were uploaded as a new template. From the ‘Merge to printer’ dialog click the OK button to allow all selected records to be merged and to open the ‘Print’ dialog. From the ‘Print’ dialog, select the appropriate printer and other printer related options. Click the OK button to open the ‘Create Activities’ dialog and start the merge. Select the ‘Create Microsoft Dynamics CRM activities’ radio button and click the ‘Activities Details’ button to open the activity detail form. Note: From the ‘Create Activities’ dialog, click the OK button to print the merge without creating activities (default settings). – The ‘Assign activities to’ section defaults to assigning the activities to self, change to assign to owners of the records in the merge or to another user or queue. – The ‘Automatically close the activities as completed is set by default. 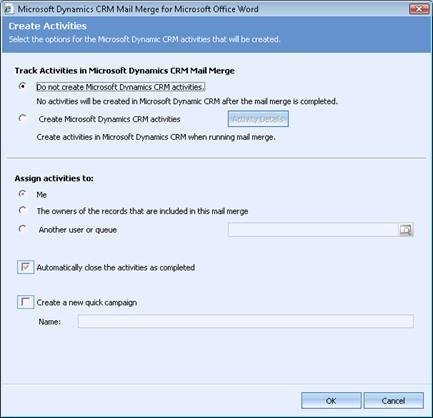 – The ‘Create a new quick campaign’ check box will enable mail merge to create a quick campaign that will contain the mail merge activities created. A ‘Name’ for the quick campaign must be included. From the ‘Activity Details’ form, change some fields on the form to suit your needs and click the OK button. This is a generic activity form and may not resemble the form for the object you are creating. The activity created will have a note tab with a hyperlink to the merge document created for future reference. When all printing is completed, the ‘Microsoft Dynamics CRM for Outlook dialog will appear, indicating that the mail merge is complete. Click the OK button. You can now close Word. Note: Another ‘Microsoft Dynamics CRM for Outlook dialog will appear to verify you want to leave mail merge. MS Word will also display a dialog asking if you want to save changes to the current document. Mail Merge is now complete. 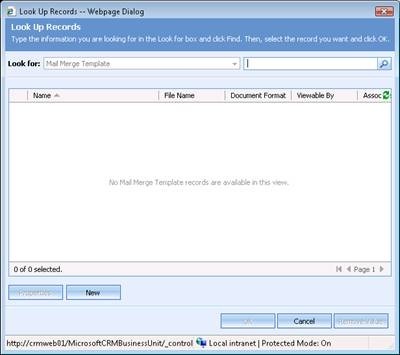 You can verify the Mail Merge records by navigating to the Contacts included in the Mail Merge and clicking the History tab (if the activities were not created as completed, they will not appear in the history grid). 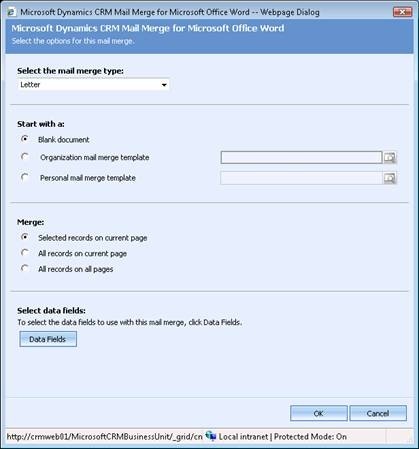 While, MSCRM Mail Merge does not have the ability to add attachments to the document you are sending, you could include some of the data you want as part of the template. Instead of an attachment you could include a URL link which is accepted by the process and makes your e-mail lighter anyway.